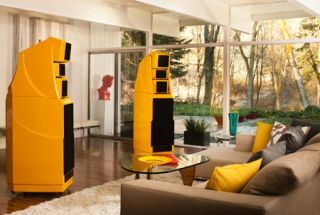 The speakers that cost £200,000 a pair | What Hi-Fi? Wilson Audio rather modestly claims that its flagship Alexandria XLF model is "the world's best speaker"
It's not often that we get invited to the launch of a £200,000 pair of hi-fi speakers. But that's exactly where we were this morning. Wilson Audio, and its UK distributor Absolute Sounds, selected the so-recently-refurbished-it-still-smells-vaguely-of-paint KJ West One store in the humid heart of central London for today’s European launch of its extraordinary Alexandria XLF floorstanding loudspeakers. They're the people to visit if you'd like to buy a pair of these, the Wilson Audio Alexandria XLF speakers to give them their full name. The good people of Provo, Utah, home town of Wilson Audio owner Dave Wilson and still the company’s HQ, have already enjoyed the prodigious sight of the Alexandria XLFs, but it's the first time the speakers have been heard outside North America – we first saw them at CES in Las Vegas back in January, when we voted them one of our Stars of CES 2012. KJ West One, a stalwart of the London high-end scene, is an ideal venue for a launch such as this – and after nearly six months as a glorified building site, it’s now looking as fresh as a daisy. Wilson Audio rather modestly claims that its flagship model is "the world's best speaker". At the price, one would hope so. So what do you get for your money? Wilson Audio's Peter McGrath and John Giolas were on hand to tell us. If you’re familiar with Wilson Audio’s Alexandria range, the XLFs will be a recognisable shape – but with the XLF, the architecture has evolved. The segmented cabinet (which is constructed entirely of proprietary composite materials) is larger and thicker than the Alexandria Series 2 speaker the XLF most closely resembles. There’s a new tweeter (a silk-dome affair dubbed ‘Convergent Synergy’), a reworked midrange baffle and a new crossover. The distinctive ‘wing’ structure of the XLF allows the upper, independent modules to be time-aligned precisely and to provide an inert platform for their support. The aim is to improve on the Series 2 in every meaningful way: dynamic contrast, harmonic expression, bass performance and linearity are the specific areas Wilson Audio has identified. ‘XLF’ refers to Wilson Audio’s latest innovation: the Cross Load Firing port. The owner can choose to configure the speakers with either a front-firing or rear-firing bass port – optimising the location of the port to suit each speaker’s specific listening environment. The company suggests that ‘lean’ listening rooms (those with a lot of glazing, for example) will benefit from a rear-ported set-up. At a not-inconsiderable £200,000 per pair, it almost goes without saying that the Alexandria XLFs are made to order. Each pair is finished in Wilson Audio’s automotive-class paint facility in any colour you may desire – just supply the Pantone number and Wilson Audio will do the rest.